Prepare cake batter and bake in greased foil-lined 13x9-inch baking pan as directed on package. Cool completely. Cut cake into pieces and arrange on serving platter as shown in diagram; set aside. Place chocolate and cream in microwaveable bowl. Microwave on MEDIUM 2 to 3 min. or until chocolate is completely melted and mixture is well blended, stirring after each min. Remove 1/4 cup of the chocolate mixture; place in small resealable plastic bag. Set aside. Add icing sugar to remaining chocolate mixture in bowl; beat with wire whisk until smooth and of spreading consistency. Spread onto cake. Decorate with candies as shown in photo. Cut 1/8-inch piece from one of the bottom corners of bag of melted chocolate. 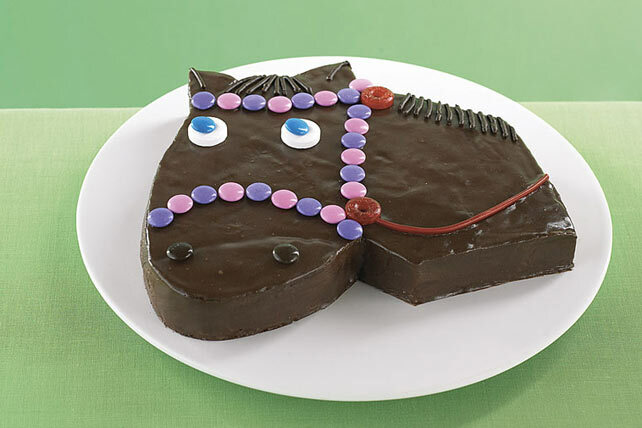 Use to pipe chocolate onto the cake for the "horse's mane." If the cake is very soft and crumbly, apply a “crumb coating” to prevent cake crumbs from mixing with the frosting. Spread a thin layer of frosting over the entire cake, then let stand 5 to 10 min. or until frosting is set. Spread remaining frosting over cake. Make sure cakes are completely cooled before frosting. A warm cake can cause the frosting to soften or melt.